Very similar to Google Wifi, Netgear Orbi is a 2×2 wave-2 based router, which can grip two simultaneous streams of data per frequency band. It also uses MU-MIMO for sending data on interconnected devices. But the good thing is that With the 30 feet away walls displacement, the Orbi dramatically faster than all of the mesh routers , more than double the Google Wifi’s performance. A single Orbi router could deliver a combined average throughput of 552.1 megabits per second (Mbps) at 5 feet. It operates on hub-and-spoke technique versus mesh which makes it an wonderful Wi-Fi router. It has 03 ports switch and 04 ports on satellite. The device consists of Qualcomm’s IPQ4019 Wi-Fi control chip and a radio as well , along with 710-MHz quad-core ARM-based processor with 512MB of RAM and 4GB of solid-state storage space using IxChariot software. It has powerful amplified antennas because of this it increases bandwidth with number of networking brands , from 866Mbps and up. 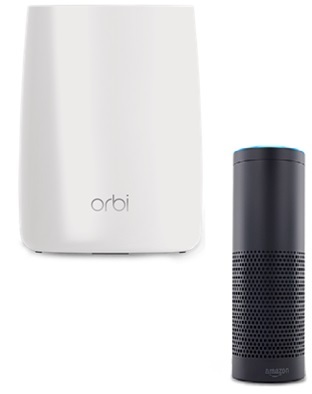 The unique is with Orbi that we can control WiFi network with simple voice commands through Amazon Alexa .This is possible by making netgear router able for remote access with the Orbi App and enabling netgear skill on Alexa app. orbi have tri-band capabilities, the router is fast, has good coverage and looks good. But the bad thing is with Netgear is that we cannot setup separate frequency SSID network, as with most other routers we can setup 5GHz and 2.4GHz frequencies separate networks with separate SSIDs .